These Kindergarten children had a choice of three warm colours or three cool colours. 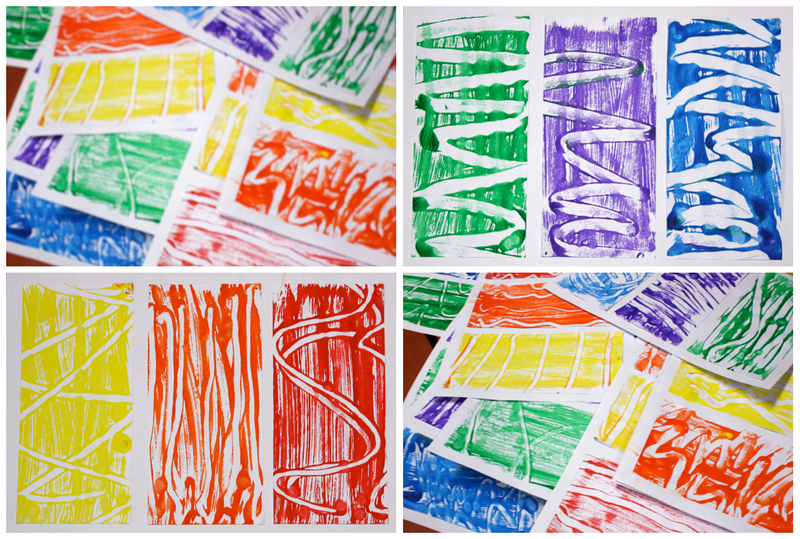 The regular classroom paint was spread directly onto their class desks by myself and then the students took turns at finger painting straight, curvy and zig-zag lines – one line type per colour. 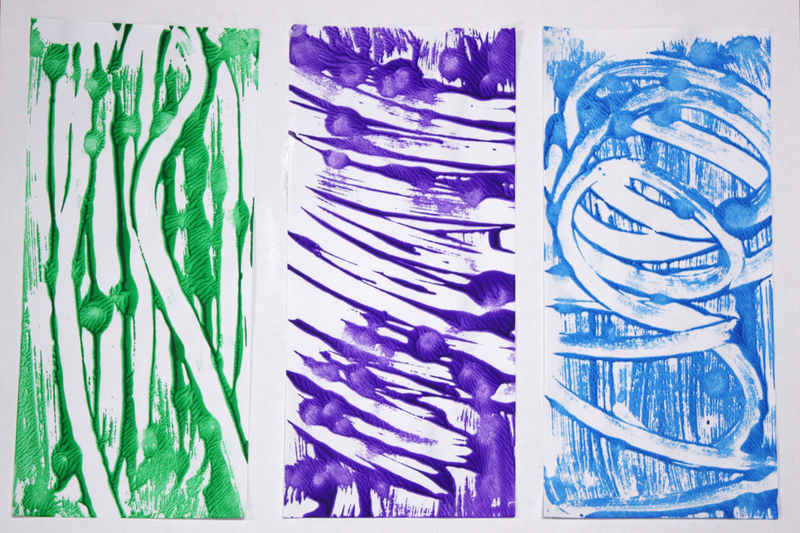 We made a single print from each. 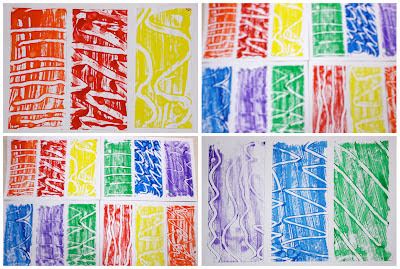 Once they were dried the children decided on the order and orientation they preferred for presenting their three prints. 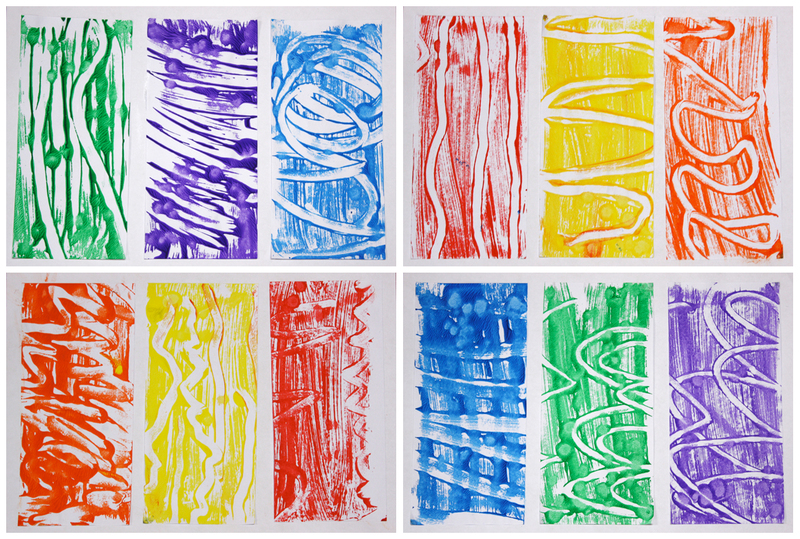 The shock, horror and pure joy of seeing their school desks smeared in paint and then painting with their fingers was a big hit with the students and they really enjoyed seeing their prints come to life as the paper was peeled from the table. 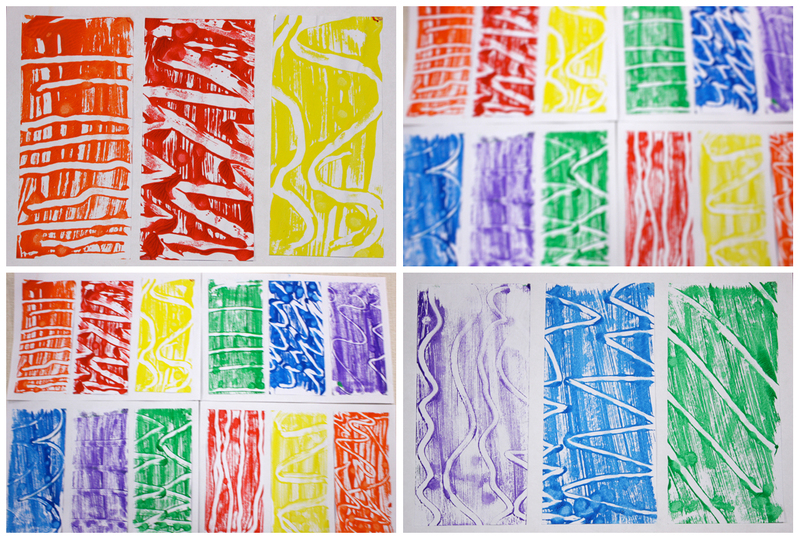 For me the really appealing part about these prints is the brush patterns created behind the finger lines. 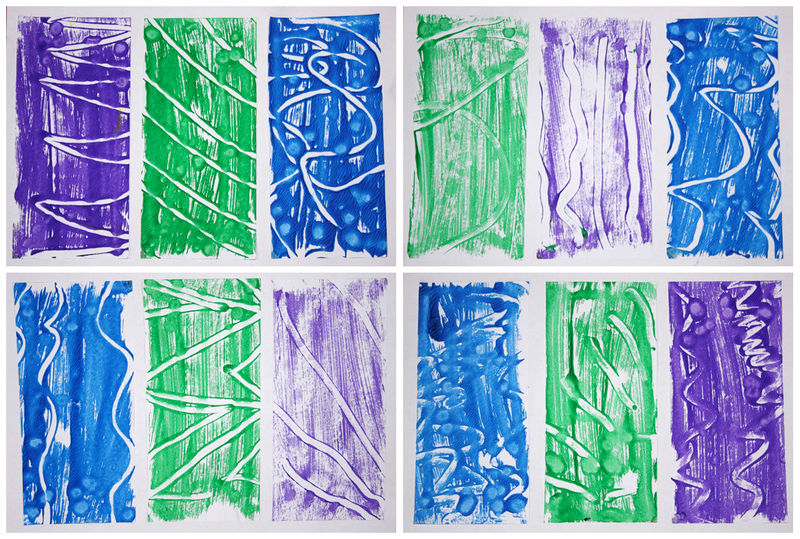 On a day when I'm feeling more adventurous I'd like to let the children be responsible for this part of the process too, and experiment with variables like more or less paint, sponges, squeegees etc. But as a relief teacher I'm always in someone else's room, with a class I don't know back to front, and in this case already with paint smeared over half their furniture, so I often end up erring on the side of caution... Perhaps I'll try this with an older class where the children are obviously up to the responsibility. I'm guessing that students of every age would relish the chance to get their fingers wet! 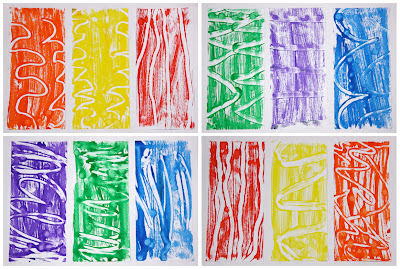 I first encountered this finger painted printmaking technique in a primary art teaching class while undertaking my undergraduate studies in primary education at UTS. 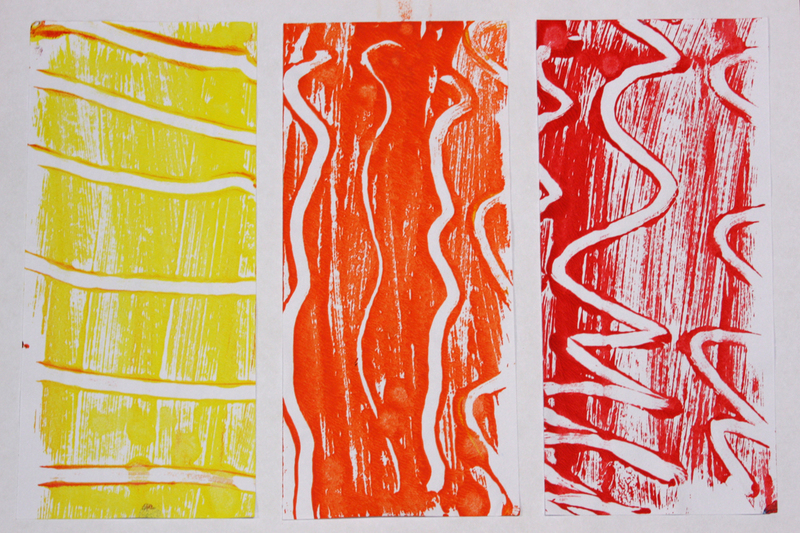 Anne Bamford was our lecturer and I really looked forward to being in her art room each week, where the learning was always hands on. In hindsight I would like to have chosen visual arts as my major, oh well. I have kept a large folder of resources we made as part of that subject and still refer to it for inspiration. Looking through it a few months ago I was reminded of this very idea and had opportunity to use it only a few days later. And by the way, even once dry the paint easily comes off the desks with a wet cloth! 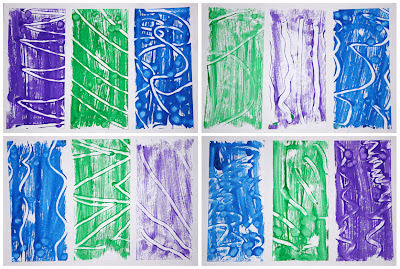 Nice monoprinting lesson. I agree, I like the contrast of the brushstrokes with the finger marks. I'll have to experiment with this. You are brave! These are really really nice. I do something similar to this with 1st grade, but I might just try this out with K. Excellent! Very cool. 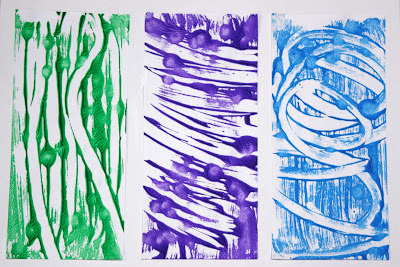 I have seen monoprinting but never like this. I bet at the end of class you could take a squeegee to the desks....thanks for posting. I did this last week with a class of new entrants. I used masking tape create a frame around the area they could paint and then print. This kept the mess contained and saved any accidental mixing of colours. The kids loved it - such a novelty being allowed to paint on the table! I recently experimented with mono prints on old laminated sheets (ones from last year that would have been thrown out). Our school would FREAK if we put paint onto the tables, but having plastic tablecloths down, the laminated sheets worked really well. 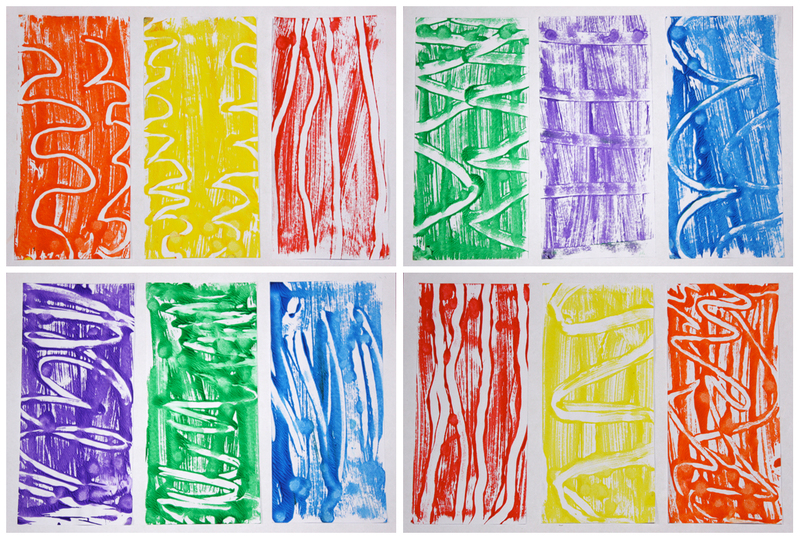 I let the kids roll the paint on with sponge rollers, and they could use fingers, chopsticks, cue tips etc to draw with. 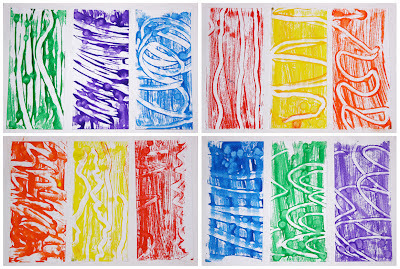 I was remembering my lessons with Anne Bamford also, thus the reason I googled, painting on desks and printing!!! Thanks you for posting. 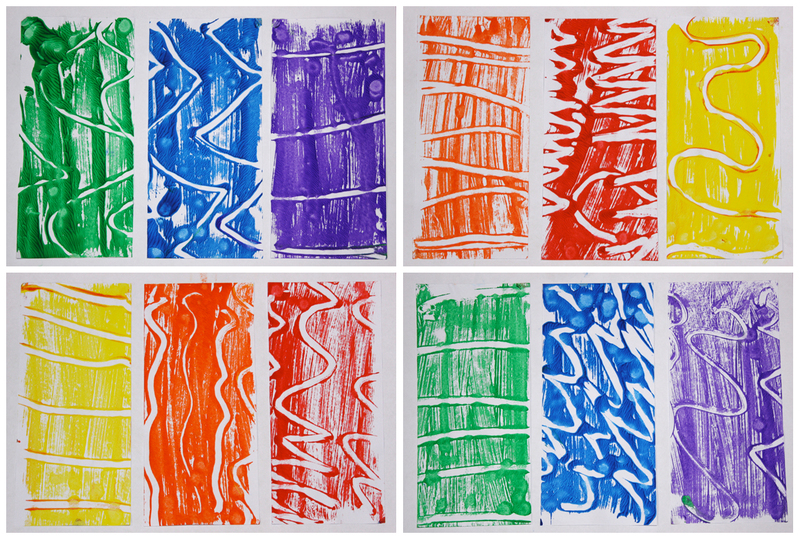 I am going to print using only blue and white and relate it to Brett Whiteley's, The Divided Unity. The reason I googled as I was trying to remember if we mixed the school paint with some washing up detergent.